Yesterday I went to three different grocery stores. Thanksgiving is next week, and my shopping list was ready to go. For everyday shopping, I almost always keep a skeletal grocery list on my cell phone, and browse just a few aisles for the items that catch my eye. Mostly, I’m a simple cook. But at the holiday season, tradition knocks at the door and I open my recipe file. For some of the classics, I barely need to look at the recipes; but then again, I don’t want to risk being caught without any chopped pecans, or sailing right past the fresh cranberries or sage. So this week, there was a real grocery list, and I spent most of the day with it. I’m not the only one thinking of Thanksgiving. Later in the day, a Facebook friend posted a new twist on one of those Thanksgiving classics: a turkey blanketed in a meticulously woven lattice of bacon. My friend – and a slew of commenters – remarked on the magical blend of flavors and speculated that brining the turkey, or even salting it, would be optional. The cook could remove the bacon for the last hour or so, to insure that the skin got brown and crispy, the way we all like it. I imagined myself bursting into tears as I struggled to create that perfect bacon lattice. I imagined the feel of slippery fat on my hands and under my nails, defying me to lift the next piece into a tidy over-under-over pattern. Would it be easier to work on a flat surface, then lift the lattice like a blanket onto the pale turkey in my roasting pan? Or would the whole thing come undone when i tried to lift it? Still, weaving bacon over the curved surface of the bird seemed like a formidable task. I noticed then that the wings and legs were simply wrapped, mummy style, in bacon strips. I knew in my heart that even getting the bacon to stay in place on a turkey mummy in my own kitchen was well beyond my skill. And I know my limits. I have wept over culinary tasks more times than I can count. Pie crust that stuck to the rolling pin. Bread dough that refused to rise. I’ve never mastered the art of peeling a potato, so my family only knew baked, not mashed. I ordered most of my children’s birthday cakes from the Home Bakery on Main Street. I’ve carried a particular grudge against jello. I remember the day in our tiny apartment in married student housing when I tried to make a molded jello salad. The aluminum mold had a fluted design, and when I flipped it over so the green concoction would let go, it stuck firm. I had followed the directions in the Betty Crocker cookbook to a T. There was no way to go around the edge with a knife; the fluting was too narrow and the knife blade wouldn’t fit. I immersed the whole thing in warm water a second time, just for a few seconds. No luck. It was then that my failure launched a full assault against my good intentions. I retaliated with a fork. I tore into the jello, the chopped celery, the bits of pineapple, with a fury that I’ve hardly experienced since. Jello took flight. It landed on the tiny kitchen table, it leapt into the sink, it hit the ceiling. Droplets scattered across the brown and white rug. Jello became something like volleyball – that thing that seemed easy to everyone but me. My anger burned white hot. How dare the jello cry “failure” when I was trying so hard? The jello, of course, was not labeling me a failure. It was a used aluminum mold, with a few spots inside where the finish had worn off. It may not have worked very well for anyone. My anger that day had nothing to do with jello, really. It was about other kinds of failings, other kinds of fear, the desperate frustration of trying to make everything important all at once. It was the desperate frustration of trying to make everything perfect. So no, I won’t be weaving bacon over my turkey this holiday season. I’m sticking with the basics: that sweet potato recipe that I’ve made for about 30 years now, stuffing loaded with celery and fresh sage, and turkey made in a Reynolds roasting bag. There will be jello, but I make it in a crystal bowl and we scoop it right out with a serving spoon. After a whole lot of Thanksgiving dinners, I know what works for me. And for that, I am truly grateful. This entry was posted in Balance, Domesticity, Holidays, Memoir, Obsessions, Overwhelmed and tagged cooking, flipping out, overwhelmed, Thanksgiving, turkey. Bookmark the permalink. I remember one Thanksgiving when my dad, who always cooked with my mom for the holidays, decided to try a new stuffing recipe made with chestnuts. Of course we were all shocked – how dare he! Luckily my mom anticipated a harsh negative reaction and had a back up pan of traditional stuffing with bread crumbs, celary and Bob Evan’s sausage. I’m real particular about new recipes I try. They have to sound so good that I cannot imagine life w/o trying them. OR, they are vegan and/or gluten free and I’m making the dish out of love for my kids. 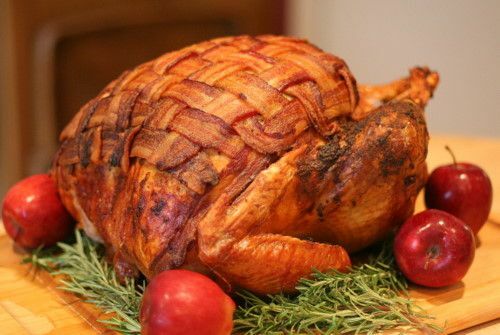 As for this bacon-wrapped turkey: you’ve got to be kidding me! Ridiculous all the way around.